A man smokes marijuana during a demonstration in support of the legalization of marijuana in Medellin. This article was originally published on April 20, 2009, and has been reposted and updated each year since. Warren Haynes, the Allman Brothers Band guitarist, routinely plays with the surviving members of the Grateful Dead, touring as The Dead. It’s the spring of 2009, he’s just finished a Dead show in Washington, D.C., and he gets a pop quiz from The Huffington Post. Where does “420” come from? Depending on whom you ask or their state of inebriation, there are as many varieties of answers as strains of medical bud in California. It’s the number of active chemicals in marijuana. It’s teatime in Holland. It has something to do with Hitler’s birthday. It’s those numbers in that Bob Dylan song multiplied. The origin of the term 420, celebrated around the world by pot smokers every April 20, has long been obscured by the clouded memories of the folks who made it a phenomenon. The Huffington Post chased the term back to its roots and was able to find them in a lost patch of cannabis in a Point Reyes, Calif., forest. Just as interesting as its origin, it turns out, is how it spread. It was Christmas week 1990 in Oakland. Steven Bloom was wandering through The Lot, that timeless gathering of hippies that springs up in the parking lot before every Grateful Dead concert, when a Deadhead handed him a yellow flyer. “We are going to meet at 4:20 on 4/20 for 420-ing in Marin County at the Bolinas Ridge sunset spot on Mt. Tamalpais,” read the message, which Bloom dug up and forwarded to HuffPost. Bloom, then a reporter for High Times magazine and now the publisher of CelebStoner.com and co-author of “Pot Culture,” had never heard of “420-ing” before. Bloom reported his find in the May 1991 issue of High Times, which the magazine found in its archives and provided to HuffPost. The story, though, was only partially right. The origin of 420 had nothing to do with a police code, though the San Rafael part was dead-on. A group of five San Rafael High School friends known as the Waldos — by virtue of their chosen hangout spot, a wall outside the school — coined the term in 1971. The Waldos never envisioned that pot smokers the world over would celebrate each April 20 as a result of their foray into the Point Reyes forest. The day has managed to become something of a national holiday in the face of official condemnation. Officials at the University of Colorado at Boulder and the University of California, Santa Cruz, which boast two of the biggest “smokeouts,” pushed back in 2009 in typical fashion. But the Cheshire cat is out of the bag. Students and locals will show up around four, light up at 4:20 and be gone shortly thereafter. No bands, no speakers, no chants. Just a bunch of people getting together and getting stoned. Today the code often creeps into popular culture and mainstream settings. Some of the clocks in “Pulp Fiction,” for instance, are set to 4:20. A “Price Is Right” contestant won YouTube celebrity by bidding either $420 or $1,420 for everything. In 2003, when the California Legislature codified the medical marijuana law that voters had approved, the bill was named SB 420. “We think it was a staffer working for [lead Assembly sponsor Mark] Leno, but no one has ever fessed up,” says Steph Sherer, head of Americans for Safe Access, which lobbied on behalf of the bill. The Waldos have proof, however, that they used the term in the early ‘70s. When HuffPost spoke with the men in 2009, they requested anonymity, preferring to go by the names they call each other — Waldo Steve, Waldo Dave, Waldo Mark, etc. Pot was still, after all, illegal. Since then, however, California has decriminalized possession of marijuana so that getting snagged costs little more than a parking ticket. Medical marijuana shops dot the landscape, and the plant has become dramatically more culturally acceptable. In the spring of 2012, they agreed to go on the record with HuffPost. “The baby boomers have been taking over. People are dying off. The generations behind them are fine,” explains Steve Capper. Mark Gravitch also agreed to be identified. The other two aren’t yet ready. “We would remind each other in the hallways we were supposed to meet up at 4:20. It originally started out 4:20-Louis, and we eventually dropped the Louis,” Capper, 57, says. It’s one thing to identify the origin of the term. But Wikipedia and Urban Dictionary already included references to the Waldos by 2009, when HuffPost first wrote this account. The bigger question: How did 420 spread from a circle of California stoners across the globe? As fortune would have it, the collapse of San Francisco’s hippie utopia in the late ‘60s set the stage. As speed freaks, thugs and con artists took over The Haight, the Grateful Dead packed up and moved to the Marin County hills, just blocks from San Rafael High School. “Marin County was kind of ground zero for the counterculture,” says Capper. The Waldos had more than a geographic connection to the Dead. Mark Gravitch’s father took care of real estate for the Dead. And Dave Reddix’s older brother, Patrick, managed a Dead sideband and was good friends with bassist Phil Lesh. Patrick Reddix tells HuffPost that he smoked with Lesh on numerous occasions. He couldn’t recall if he used the term 420 around Lesh, but guessed that he must have. The bands that Patrick managed for Lesh were called Too Loose to Truck and Sea Stones; they featured not only Lesh but rock legend David Crosby and acclaimed guitarist Terry Haggerty. Lesh, walking off stage after a Dead concert in 2009, confirms that Patrick Reddix is a friend and says he “wouldn’t be surprised” if the Waldos had coined 420. He isn’t sure, he says, the first time he heard it. “I do not remember. I’m very sorry. I wish I could help,” he says. As the Grateful Dead toured through the ‘70s and ‘80s, playing hundreds of shows a year, the term spread though the Dead underground. Once High Times got hip to it, the magazine helped take it global. Sometime in the early ‘90s, High Times wisely purchased the web domain420.com. The Waldos say that it took just a few years for the term to spread throughout San Rafael and start cropping up elsewhere in the state. By the early ‘90s, it had penetrated far enough that Dave Reddix and Steve Capper began hearing people use it in unexpected places — Ohio, Florida, Canada — and spotted it painted on signs and scratched into park benches. In 1998, the Waldos decided to set the record straight and got in touch with High Times. “They said, ‘The fact is, there is no 420 [police] code in California. You guys ever look it up?’” Bloom recalls. He had to admit that, no, he had never looked it up. Hager flew out to San Rafael, met the Waldos, examined their evidence, spoke with others in town, and concluded they were telling the truth. “No one’s ever been able to come up with any use of 420 that predates the 1971 usage, which they had established. So unless somebody can come up with something that predates them, then I don’t think anybody’s going to get credit for it other than them,” Hager says. A volunteer displays jars of dried cannabis buds at the La Brea Collective medical marijuana dispensary in Los Angeles, California, March 18, 2014. The Waldos have evidence to back up their story, now stashed away in a vault in a San Francisco bank. Reddix, Gravitch, Capper and another high school friend, Patty Young, gave HuffPost a tour of the vault, where they keep a flag with 420 stitched onto it, letters, newspaper clippings and other pieces of memorabilia. 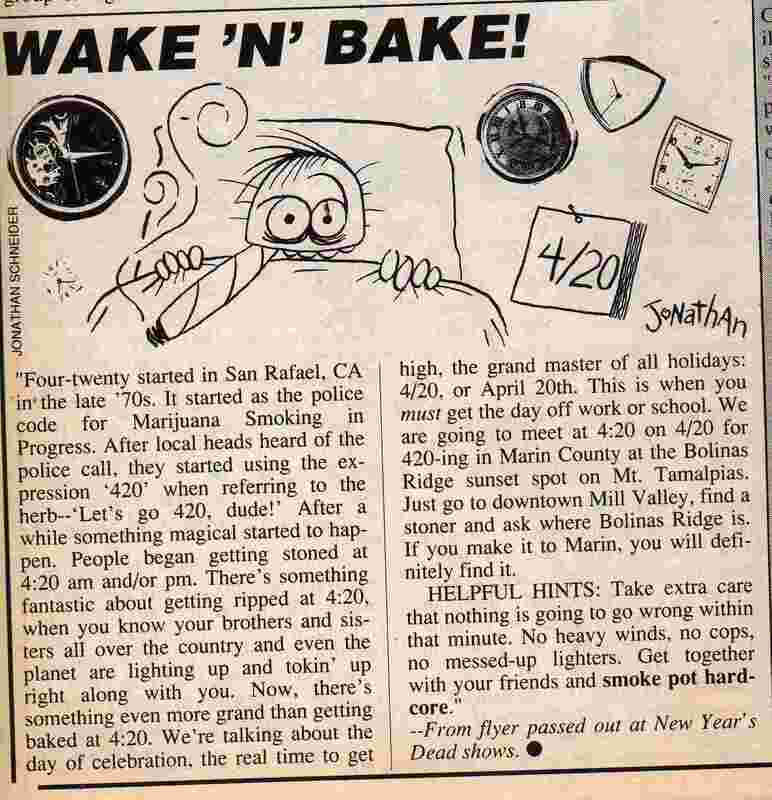 And there it all is: A clipping from a 1970s issue of San Rafael High’s school newspaper, in which a student claimed the one thing he’d want to say in front of his graduating class was simply “4-20.” A letter postmarked 1975, from Waldo Dave to Waldo Steve, rife with 420 references. The official 420 flag, which Young tie-dyed in her art class. The bank teller watches as the Waldos show off their archives. “Do you know what 420 means?” Capper asks him. The teller pauses, then grins sheepishly. “Yes, sir,” he says. The Waldos are slightly conflicted about what to do next. Reddix is gung-ho about telling the story widely and publicly. Capper is more circumspect, worried that releasing too much would cost them future commercial possibilities. The Waldos are considering a documentary, a dictionary of the rest of their slang and whatever else might be out there for five guys who coined the term 420 four decades ago. “I still have a lot of friends who tell their friends that they know one of the guys that started the 420 thing. So it’s kind of like a cult celebrity thing. Two years ago I went to the Cannabis Cup in Amsterdam. High Times magazine flew me out,” says Reddix. But “we never made a dime on the thing,” he says, half boasting, half lamenting. Reddix is now a credit analyst, with a side interest in filmmaking that led to the documentary “Roots Music Americana.” He works for Capper, who owns a specialty lending institution and lost money to the con artist Bernie Madoff. When we spoke in 2009, Capper was spending more time composing angry letters to the Securities and Exchange Commission than he did getting high. The other three Waldos have also been successful, says Capper, who notes he keeps in close touch with them all. One is head of marketing for a Napa Valley winery. Another is in printing and graphics. Gravitch is an operations manager in the construction industry. Ryan Grim is the author of “This Is Your Country On Drugs: The Secret History of Getting High in America,” available from Amazon and at independent bookstores. Sign up to get his semi-occasional newsletter here. In 2012, this story was updated to include, for the first time, the full identities of the men behind the coining of the term “420,” as well as additional details. This year, it's updated to include the backstory of the Coast Guardsman involved. Mollie Reilly and Carly Schwartz contributed to the reporting.